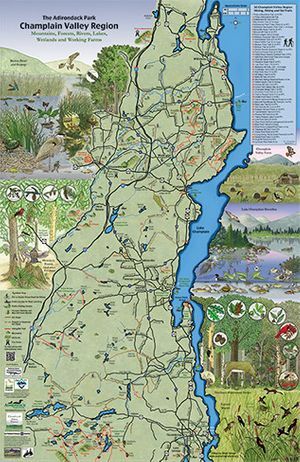 Designed and illustrated by Adirondack Illustrator, Sheri Amsel, the Champlain Valley Poster is a map and visual guide to the region's recreational and ecological treasures. The map highlights 50 hiking trails, public fishing and small boat launch accesses, public parks, dirt roads and scenic paved roads for biking, and farmers' markets and farm stands. It also includes and illustrated look at six natural communities with key species that help make the Champlain Valley such a rich biological treasure. Available in an unlaminated or laminated finish. Measures: 24" x 37"